An enthralling literary debut that tells the story of a young girl’s coming of age in the cutthroat world of New York City ballet—a story of obsession and the quest for perfection, trust and betrayal, beauty and lost innocence. In the roiling summer of 1977, eleven-year-old Mira is an aspiring ballerina in the romantic, highly competitive world of New York City ballet. Enduring the mess of her parent’s divorce, she finds escape in dance—the rigorous hours of practice, the exquisite beauty, the precision of movement, the obsessive perfectionism. Ballet offers her control, power, and the promise of glory. It also introduces her to forty-seven-year-old Maurice DuPont, a reclusive, charismatic balletomane who becomes her mentor. Over the course of three years, Mira is accepted into the prestigious School of American Ballet run by the legendary George Balanchine, and eventually becomes one of “Mr. B’s girls”—a dancer of rare talent chosen for greatness. As she ascends higher in the ballet world, her relationship with Maurice intensifies, touching dark places within herself and sparking unexpected desires that will upend both their lives. In the present day, Kate, a professor of dance at a Midwestern college, embarks on a risky affair with a student that threatens to obliterate her career and capsizes the new life she has painstakingly created for her reinvented self. When she receives a letter from a man she’s long thought dead, Kate is hurled back into the dramas of a past she thought she had left behind. 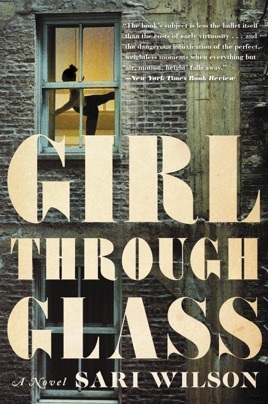 Told in interweaving narratives that move between past and present, Girl Through Glass illuminates the costs of ambition, secrets, and the desire for beauty, and reveals how the sacrifices we make for an ideal can destroy—or save—us. Wilson's debut novel begins in 1977 and centers on Mira Able, an 11-year-old straining to push through the physical and emotional demands of the New York City ballet world. It's an ambition complicated by her parents' lack of interest in ballet and unraveling marriage, and further complicated by Maurice, an older, disabled man interested in Mira and her future as a ballerina. Meanwhile, interwoven in alternating chapters is the present-day story of Kate, a dance historian and professor who, after sleeping with a student, is compelled to seek closure from her mysterious past in New York. Wilson's premise and structure could have been disorganized and dull in less deft hands, but the story is a uniformly engrossing look into the fabled world of hypercompetitive 1970s ballet. Mira and Maurice's relationship has the fairy tale feel of Beauty and the Beast, but the pages brim with the realism of the gritty, crime-riddled New York, especially as the plot ricochets toward a surprising, and bittersweet, merging of Kate's and Mira's stories. Wilson writes lovingly of ballet and elevates the coming-of-age story with a dark undercurrent about the cost of obsession.